Serial Port Monitoring Control (SPMC) - RS232 Data Acquisition and Com Port Control Component Library, Modem Access Component. Connection Sniffer and Port Test Software Library. The library lets you enumerate all installed serial devices, including, but not limited to serial ports and modems. The library lets you enumerate all installed serial devices, including, but not limited to serial ports and modems. ...... The Monitor object can be attached to the device at any time, no matter if the device is being currently used or not. You can also detach from the device at any time. Supporting a wide variety of programming languages and platforms, the SPMC library makes it very easy to start using it in your software project. GXSerial: an easy way to build multithreaded, serial communication applications. 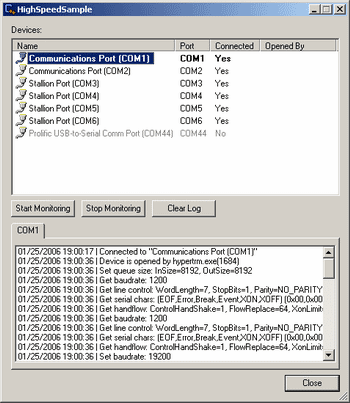 Program allows you to map any serial ports to any other serial ports. Perform advanced invoice sales reporting. Captures & displays text/binary serial port data from COM1 to COM12. Qweas is providing links to Serial Port Monitoring Control 2.14.00.3249 as a courtesy, and makes no representations regarding Serial Port Monitoring Control or any other applications or any information related thereto. Any questions, complaints or claims regarding this application Serial Port Monitoring Control 2.14.00.3249 must be directed to the appropriate software vendor. You may click the publisher link of Serial Port Monitoring Control on the top of this page to get more details about the vendor.